The word zen is widely used, not only in America, but also in the other parts of the world. However, it is actually a Japanese word. It all traces back to the Sanskrit people and the word dhyana, meaning to see, to observe, to look. The Chinese had their own translation of it which was chan and the Japanese with their word zen. All those words mean one thing – meditation. If asked about the meaning of zen, most people will eagerly tell you it is a state of mind or peace. Some would even call it discipline. These answers point to good knowledge , but it doesn’t mean you know the deeper meaning and value of zen. It goes way beyond the state of the mind. Zen is a form of wisdom, compassion, and tradition. Zen flower is a type of zen doodles and to be exact, zen doodles aren’t restricted. 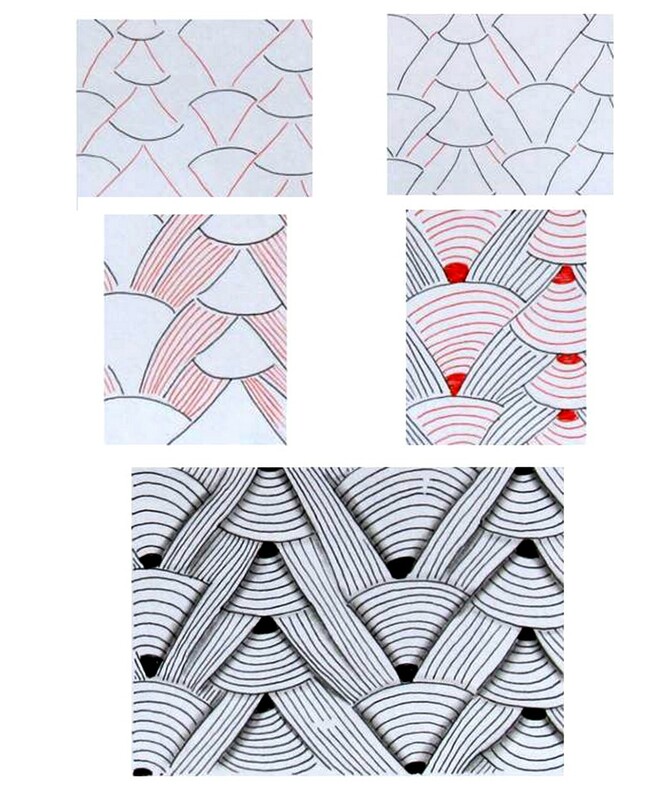 I am not trying to say restricted as if it is a bad thing because zentangle, despite its restrictions, doesn’t and will never, ever hinder anyone from getting into a state of meditation or relaxation while drawing. Let me tell this to you straight – zentangles have borders and zendoodles do not. However, since zendoodle is very much a free-hand work, some people attempt to add a border and the outcome still looks just fine. But then again, there is no need for borders. What you are going to need are outlines and some still like to call them strings. 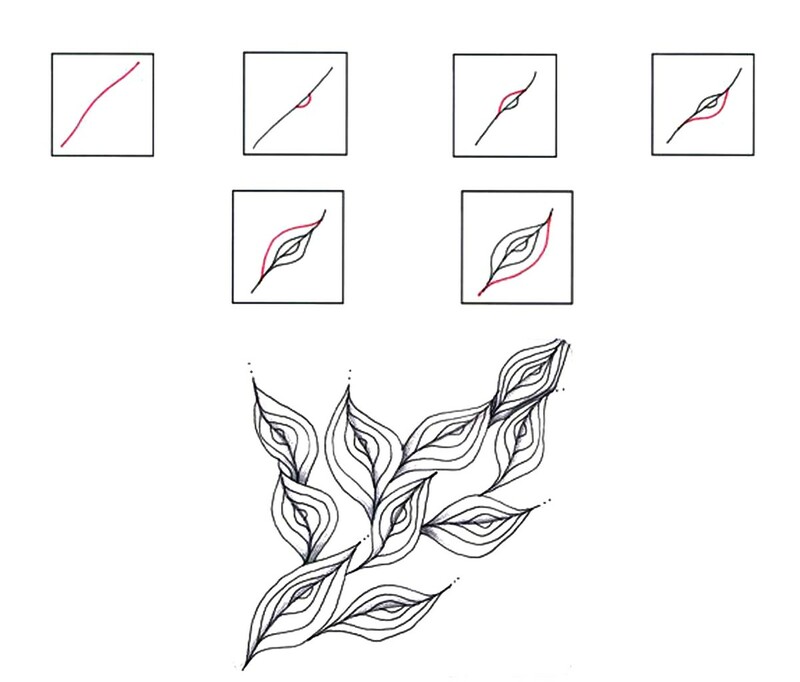 However, strings are used in zentangle and outlines for zendoodles are used in a different manner than that of zentangle. 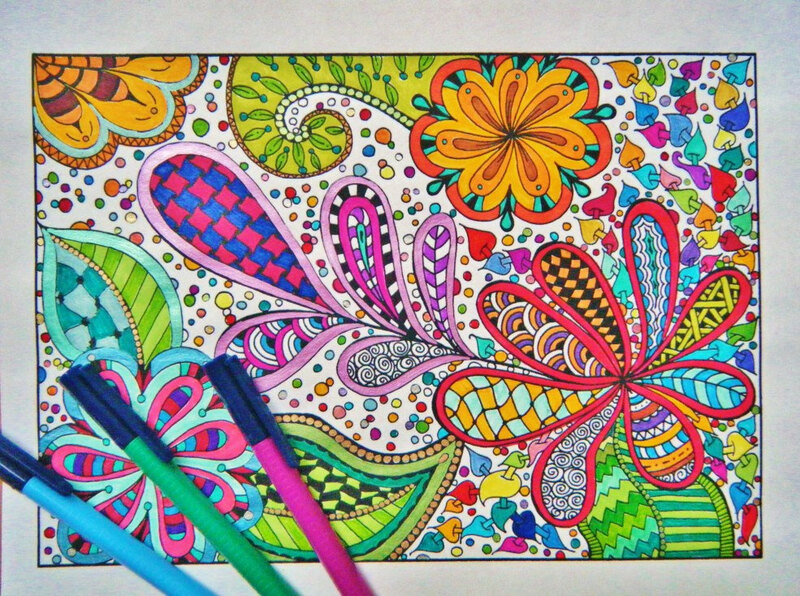 Zendoodle is freehand, meaning you are free to make your own string. However, if you are quite new to this, you will need some guides or inspiration to help you with. To save you from the trouble of searching through the internet, here’s something to make things easier for you. 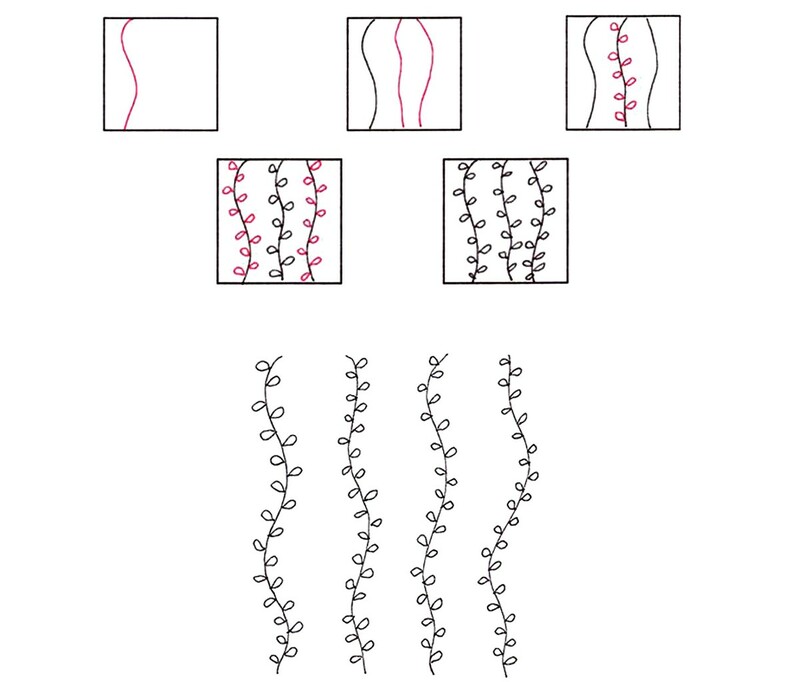 Below are a couple of strings to add zest to the zen flowers you will be making in the future. Again, a simple reminder, whenever you plan to choose one of the strings above to use in your zen flower, simply ignore the border. You are free to use any of the strings or make one of your own to fill a petal, leaf, or stem with. The design, beauty, and intricacy of your zen flower piece depends on how you let your flow transfer freely through your works. Pencil – Usually for practice lines which are layered with ink from a felt-tip pen. It is also used for shading by many people especially if you want a light shade. Felt-tip pen – Used for finalizing a line or if you want to emphasize a certain line. This is also used for shading especially if you want the darkest, blackest shade. Reference – A must for beginners. You can’t just scrawl carelessly on the paper if you are after a worth-keeping masterpiece. There are tons of books, videos, pictures, or written guides that can be found through the internet. As for the books, you can find them in your favorite bookstore so no need for you to worry. You will need inspirations for patterns and trust me, there are tons of very lovely patterns waiting to be discovered by you. Eraser – This is important so you can clean up the base or practice lines after you have layered your work with ink. Workplace – Make sure your workplace is free of any form of disturbance that could disrupt your focus. Choose the best time for when you can draw and color freely. Prepare your desk or work space and make sure everything you will need is near. Once you enter the state of meditation or when you are focused enough that your hand is drawing in auto-pilot mode, you can’t afford to stand and get something you need for drawing or you will risk losing your concentration. Feel free to add things like candles, diffuser with your favorite essential oil, crystals to absorb negative energies, or your favorite soft music in the background. Anything will do as long as it doesn’t disrupt your focus. A bottle of water and a little snake will be a good addition on your table, so you don’t need to stand up in case you feel thirsty or hungry. We can’t just stop with strings or outlines, can we? Even if you already have your beautiful outline, it would still look gloomy without the patterns that give zen art its distinguished personality. 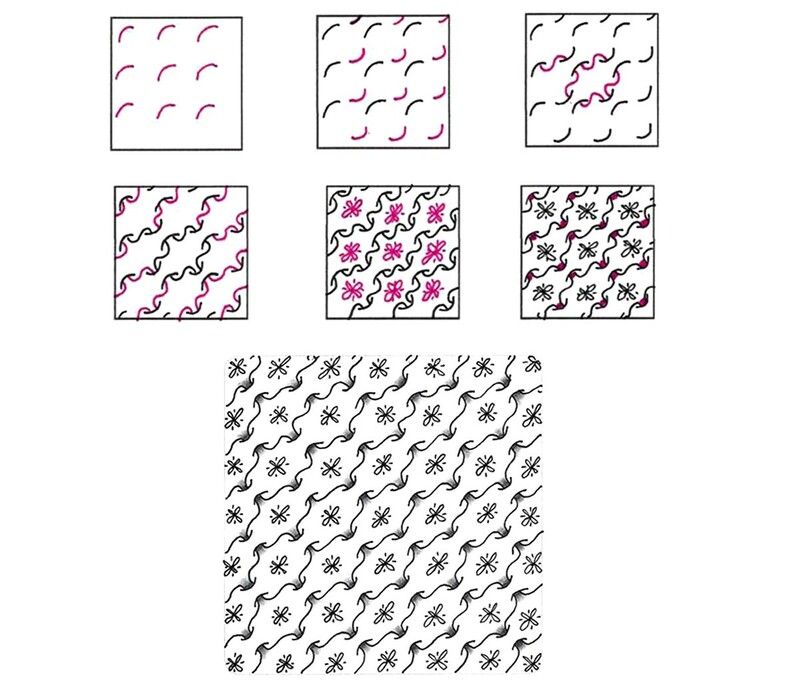 You do not have to think hard for patterns especially if you are a beginner. I will give you some samples that you can follow before. Let’s proceed. This pattern is perfect for when you make your leaves. You do not need to make them look extra complicated because the lines of this pattern are enough to make you feel relaxed. REMINDER: There is no up or down and left or right for this pattern. You are free to make it flow wherever you want. 2.Add a semi-circle or an ear on the right side. Actually, it is up to you if you want to start on the other side because like I mentioned, there are no up or down and left or right on this pattern. 3.Add another semi-circle on the other side and make sure this time it is a little bigger than the first one you made. 4.Go back to the right side and draw another semi-circle that is bigger than the two previous semi-circles you’ve done before. The key here is making sure the ends or points of the semi-circle wouldn’t meet or touch. They are supposed to be alternate. 5.You are free to add more semi-circles on either side alternately depending on how big you want it as long as it doesn’t reach the end point of your initial line. This simple, very easy yet refreshing pattern works best as a background, however, if you are feeling a little adventurous feel free to use it to fill a petal of a zen flower. 1.Draw a wavy and not-so-perfect line from top to bottom of your chosen space. This pattern can fill a whole page or a petal of your zen flower. You do not need to be meticulous about this wavy line because you will want the kelp to look natural. 2.Add more wavy lines from top to bottom. There is no need for you to mind the distance of the lines themselves as long as they are not too close to each other. 3.Go back to one of the vines you made and add the leaves . Make sure the leaves are arranged alternately to make them look natural. If you want certain variation for the shape and look of the leaves, go ahead. 4.Finish adding the leaves for the rest of the vines. You can even add flower blossoms in them or bees if you want. Finally, layer your drawing with the ink of a nib-pen. If you feel like adding shading for each leaf for depth, do so. After all, this is free hand and if your mind tells you to do so, feel free to follow it. This pattern can fill your flower petal, especially if you are making a big one. From afar, it will look a rather subtle woven finish to a petal or zen flower. REMINDER: There is no up or down and left or right for this pattern. You are free to make it flow wherever you want. In this case, we will follow the diagonal orientation of the sample pictures. 1.First, let me remind you that our sample’s orientation is diagonal going to the right. Later on, you are free to make diagonal, vertical, or horizontal ones. 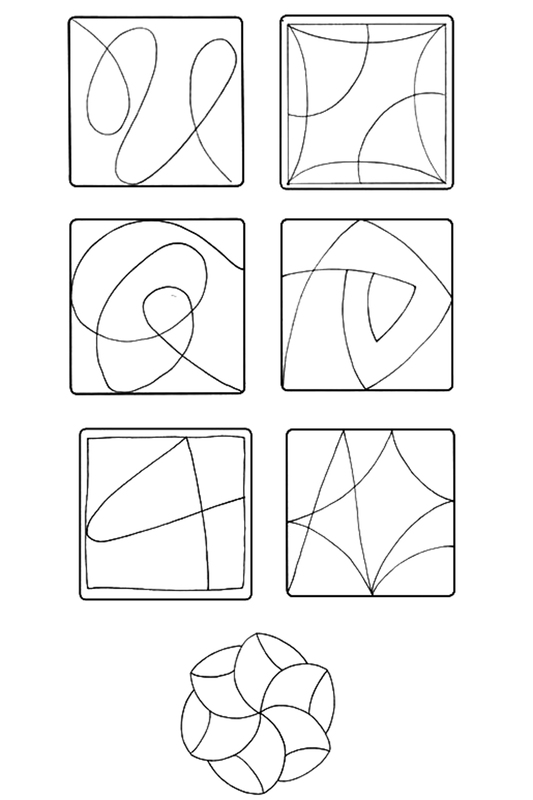 Let us start drawing semi-circles arranged diagonally. Try to make the distance of the semi-circles as even as you possibly can without the help of a ruler. It is also up to you how big you want this pattern to fill up your page, it can fill a whole petal beautifully or a whole page just as well. 2. Now, add another set of semi-circles between each semi-circles you made previously. Again, they should be arranged diagonally, but facing the opposite way. 3. There should be spaces for each semi-circle regardless of where they are facing. Draw an S with its starting point touching the middle of one semi-circle and the end point touching the semi-circle facing the opposite way right below it. Continue adding S-shapes for every two semi-circles facing the opposite way just like the picture below. It will look like a small chamber with two openings. 4. Continue until you make small interconnected chambers just like on the picture. 5. Feel free to add designs in the center of each chamber. In this case, the sample boasts a little flower in each chamber. 6. After adding a flower in all the chambers, you can now add shading to add depth. This very rich pattern is sure to fill your zen flower with life. While some may think this pattern is quite simple and not even mesmerizing, wait till you see it in its full glory with shading. 1.First is to draw a set of cones, arranged in a column, to fill up the space of your choice. Draw another column of cones right beside the first set you made, except this time, you have to make sure the this new set of cones have their sharpest points facing the opposite direction from the previous set you made. Beside this second set of cones, draw a new column of cones with the sharpest points facing the opposite direction of the sharpest points of the second column. Keep making another alternate set of cone columns until you fill the space you wanted. 2.Look closely to each cone that you made. Each of them has three corners and two points will be located on each side of the cone. What you are going to do is extend the lines on both sides of each cone until it touches another cone from another column. Do this to all the other cones. 3.Now, start filling the spaces outside the cones by following the direction of the extended lines you made. Do this until you have all the spaces around the cones covered with lines. 4.By now the only unfilled space you have left are the insides of the cones. Locate the sharpest points of each cone and shade it. They will start to look as if they are newly-sharpened pencils. Do this to all the cones. The broadest end of each cone is curved or concave, follow that shape and fill the insides of each cone with curves until every cone are done. After that, feel free to add some shadings to give depth and you are done. This entry was posted in Zendoodle as an Art on October 21, 2015 by Doodle Art Club.